I’ve been told repeatedly that once the siding goes up, the work seems to come to a standstill. That may appear to be the case from the outside, but that’s because the best action is on the inside. I’m rather fond of the bathroom sinks. The downstairs guest bath will have slab Uba Tuba countertops with an undermount sink, but the rest of the sinks will be the kind pictured above. All of the bath faucets are Price Pfister GT42-ST0, except for one. 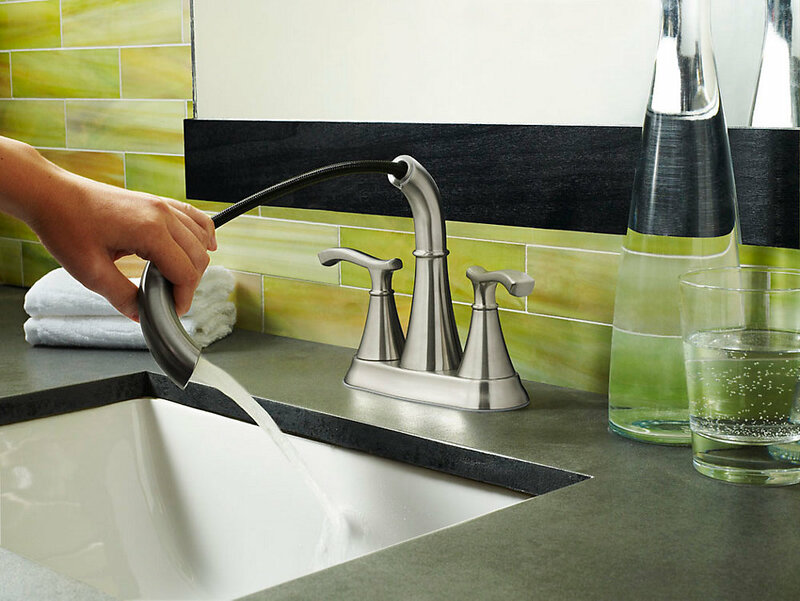 The right sink in the master bath will have an oddball: the Price Pfister F-548-ID. This is the only bath faucet I’m aware of that has a pull-down spray head like a kitchen sink. Not only is it handsome, but I’ll be able to ensure a clean sink and counter after shaving. Speaking of plumbing, our water heater has arrived and is connected for gas. The final hookup to water will most likely come after the bathroom and kitchen counters have been completed, when the plumber is out hooking up the rest of the fixtures. The millwork has been on site for a couple of weeks now and most of it has been installed. We chose a rich dark brown called Mocha that will compliment the rest of the finishes quite nicely. The kitchen hardware is all smooth glide, soft close. You’d be hard pressed to put on an effective temper tantrum using this cabinetry. We picked out the cabinets to fit our kitchen workflow. Just enough drawers, but plenty of tall cabinets for all-around storage. In this kitchen, the pantry is all around you since the cabinets go up to nearly 8′ at the top. There is a tall, skinny pull-out oil rack and a hidden drawer set for pots and pans next to the stove. 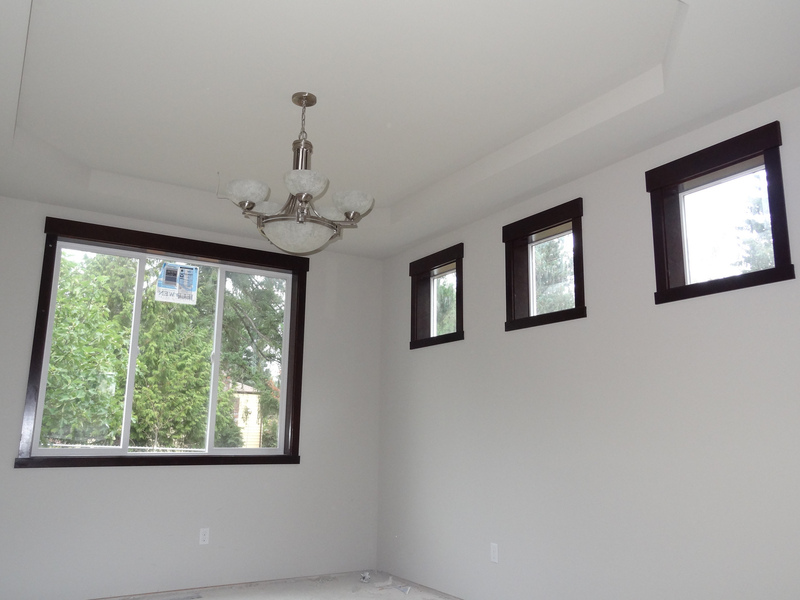 The window trim, doors, and floor molding are installed throughout much of the house. We are working out some minor kinks with a pair of French doors that open the wrong way, but everything looks just fantastic once in place. My wife has completed painting one of our daughters’ rooms. She chose a particularly difficult and labor-intensive striped scheme for the rooms, but the results are worth the effort. Oddly, the colors react in a very interesting way with one-another. 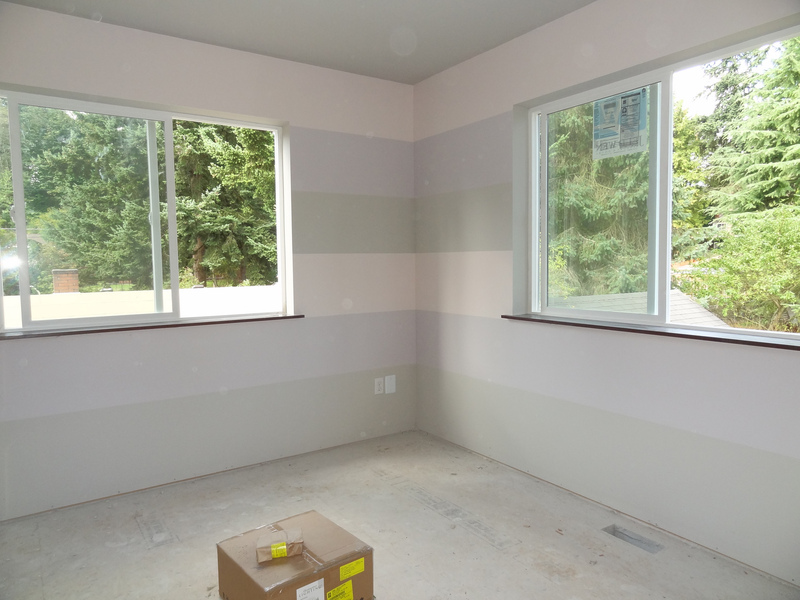 Once carpet and baseboard are in, I expect the picture to shift yet again, but the colors you’re seeing from top to bottom are very light pink, light purple, then Agreeable Gray (the same color as the rest of the house). The photo on the left is a rather faithful reproduction of what you see when you walk into the room. To my eye, it looks like cream, blue, and green. 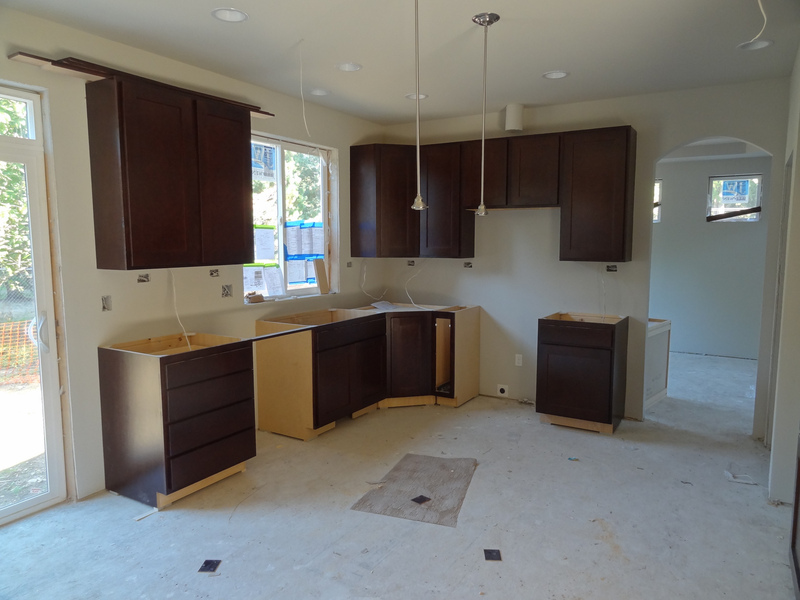 The appliances will be here in three weeks, and there is a lot to be done in the meantime. The slab is on order, the last of the light fixtures show up today, and all of the tile will be going in soon. This entry was posted in Construction and tagged appliances, bathrooms, cabinets, electrical, lighting, materials, paint, photos, plumbing, progress, trim, windows. Bookmark the permalink.